Last night after the game (pick one), my brother was flipping through channels when we happened to pause on the movie Gremlins. Everyone know that movie? Featured this ridiculously cute little critter? I knew there were two basic rules about Gremlins- don’t get them wet, and whatever you do don’t feed them after midnight- but I didn’t realize sunlight and bright lights were part of that too, until someone is sitting there desperately flashing a polaroid to get out of a tight spot. My brother didn’t think anything of my asking at first- it’s been quite a while since he’s seen them- but then it occurred to him to ask if I’d ever seen the movie. And while he was sitting on the couch giving me an appalled stare, I tried to remember why. The first movie actually came out in 1984. I wasn’t born yet. However, I know that when we were growing up, we had at least a Beta cassette of it, if not the VHS. It was definitely in the house, because I remember my brothers watching it. And I remember my mother taking one look at the stuffed Gizmo I’d inherited from my older brothers and promptly taking me out of the den. When I got old enough to want to stay, she explained to me that I was still too young, that I would get terrible nightmares, and I would probably start crying every time I looked at Gizmo, for all that he’s supposed to be the good one. It didn’t mean I’d never be allowed to watch the movie, just not yet. Besides, as consolation for not being able to watch the movie with the boys, we’d go curl up on her bed with a book or two, which in my mind was so much better. It took me a little longer to figure out why I never saw it after that, and then it hit me: Furbys. Those terrifying, demonic pieces of fluff and machinery that singlehandedly did more to scare me than anything since Teddy Ruxbin. Between those two toys, I never, ever wanted to see Gremlins because I couldn’t stand the thought of my sweet, by then very battered and mended Gizmo having scary cousins. Teddy Ruxpin seriously gave me nightmares. We had one- briefly. I’m not sure if my mom hid it or gave it away because it freaked out all three of us kids so thoroughly. 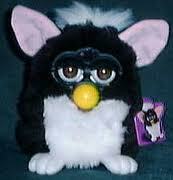 Furbys, though…Furbys were actually worse, mainly because of the glitches. I had some friends at school who had Furbys. They were this HUGE thing when they first came out. All the cool kids had them. Needless to say, I was not a cool kid. They’d bring them to school until they were banned, and then they’d have slumber parties or after school hang outs which would feature the demon creatures talking at you. And then some of them started talking on their own. I don’t mean that they became sentient or started making up their own words, or anything. But there was some kind of sensor, or control, or something so you could tell them when to talk and when to shut up. And that control started glitching. The first time it happened was a slumber party. Twelve or fifteen tween girls all finally sacked out sometime after midnight, fast asleep in sleeping bags, and suddenly around ten Furbys start babbling out of nowhere. No joke, one girl wet herself, started crying hysterically, and her mom had to come take her home in the middle of the night because the girl was so embarrassed. Anything else and we probably would have been teasing her, or at least laughing (like if we’d been telling ghost stories and she just had a bad dream; we were old enough by that point to find them silly). But we weren’t teasing, and the only laughter was that thin, nervous kind that trails off into hiccups and shallow breaths. The Furbys had successfully freaked us out. We eventually got over it by reminding ourselves that the Furbys had those little scanner thingies to know when another Furby was nearby so they could “talk” and that they’d probably just recognized the presence of other Furbys. Okay, yes, that was creepy enough, but it gave a solid excuse for why they’d suddenly start talking in the middle of the night. Over the next few weeks, more kids at school started telling us about incidents like these. As scary as it can be at a slumber party- where theoretically you could blame it on some sort of prank by one of the others- it started happening when there was no additional Furby or human around. Just you, the Furby, and your bedroom in the middle of night, where you were supposed to be safe from the things that creep in the night. Usually once a hacker gets hold of something, it becomes faintly ridiculous and funny, because you know a human with a sick sense of humor has reprogrammed them to say certain things. But when it’s still all based off the original programming? 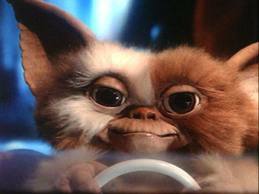 Furbys made me terrified that something would be wrong with Gizmo, so I absolutely refused to watch the Gremlins movies even after my mom gave her permission. I still won’t watch them. I don’t know that I’d leave the room if someone else put it on, but I will never rent or buy it, simply because I’m still freaked out by those frickin’ Furbys. So, as we come into the Halloween season- ushered in really well by Nova Ren Suma’s guest blog series on What Scares You?– what are your lingering childhood fears? Please share below! And everyone, please have a spooky (and safe) Halloween!